Jacob Watson, a 2011 Ouachita Baptist University alumnus, won the $10,000 Second Prize in the Lotte Lenya Competition, held recently at the Eastman School of Music in Rochester, N.Y. The Lotte Lenya Competition, sponsored annually by the Kurt Weill Foundation for Music, is a renowned competition for young artists, ages 19-30, who specialize in singing both opera and musical theatre repertoire. This international theatre singing competition has sent on winners to play major roles on Broadway andperform with prestigious opera houses such as Metropolitan Opera. Matthew Grills, a tenor from Rochester, N.Y., won the $15,000 First Prize. Watson tied with Justin Hopkins, a bass-baritone from Philadelphia, Pa., for second prize. Third prize and $7,500 was awarded to Megan Marino, a mezzo-soprano from Malvern, Pa.
“Jacob’s second place finish in the Lenya competition affects him positively in a number of ways,” said Dr. Jon Secrest, OBU professor of music. “First and foremost would be the cash award attached to the placement. When youngperforming artists are attempting to make their way in this profession, they don’t always know where the next paycheck will come from. Winning competitions and prizes such as the Lenya take the pressure to ‘earn’ their way in the marketplace off a little bit, allowing them to continue perfecting their performing craft, then auditioning for productions as they feel they are ready to. “In addition, I’m sure Jacob has already made new professional contacts as a result of his being the second place winner of this competition. He will be remembered by casting directors and others in the field of performing arts as they arelooking for singer/actors to fill roles in their productions,” Secrest said. The competition began in January when contestants sent in a DVD of their performances of four songs of their own choosing. From there, Watson moved on to the semi-finals, held in New York City. “At the semi-finals I got to sing not only for the Kurt Weill Foundation but my judge was Tony Award-winning actress and soprano Victoria Clark,” Watson said. “That was pretty incredible as she is a well-known and successful performer as well as teacher. After I performed, she gave tons of wonderful feedback to take my performance to an even higher level. One week later, I got a phone call informing me that I had made the finals. “From mid-Marchto the end of April, the finals, I worked on making my performances as nuanced and specific as was possible,” Watson said. “During the finals I got to sing for Rebecca Luker, a three-time Tony-nominated soprano and actress; Rob Berman, a Broadway music director and music director of the Broadway Encores! Theatre; and Theodore S. Chapin, president of the Rodgers and Hammerstein Organization as well as the chairman of the board of directors for the American Theatre Wing. “It was an incredible feeling to place in this competition among some of the best singing actors I’ve ever had the privilege of performing with. Every single person in the competition was passionate about honest storytelling using music. It was so inspiring to be amongst a group of people like that,” Watson added. “This competition was so enjoyable because of the shared passions among the performers and judges for storytelling in every way possible. There were opera singers who love music theatre and music theatre singers who love opera, as well as everything in between. This is something I believe is necessary in the world in which we perform,” Watson said. “People always try to split people up into boxes as either opera singers or music theatre singers when the truth is that we are all storytellers and should know and want to tell stories in every medium possible. My desire is to see those walls begin to break down and this competition celebrates that ideal. That was one of the most wonderful things to be around. Watson’s plans for the future include performing with the Janiec Opera Company at the Brevard Music Center this summer. He will perform as Rodolfo in La Boheme and in the chorus of Barber of Seville, Dialogues of the Carmelites and HMS Pinafore. When his time with the Janiec Opera Company is finished,Watson will travel to Shreveport, La., to be a resident artist with the Shreveport Opera where he will be performing and covering leads in their operas as well as performing in their educational outreach program. Watson’s ultimate goal is to move to New York City. “The Division of Music and Department of Theatre Arts are so very pleased for Jacob and proud of the accomplishments he has achieved already. His talent is one of the most substantial to come through our program, and we know God will lead him to even greater opportunities in the future,” Secrest said. 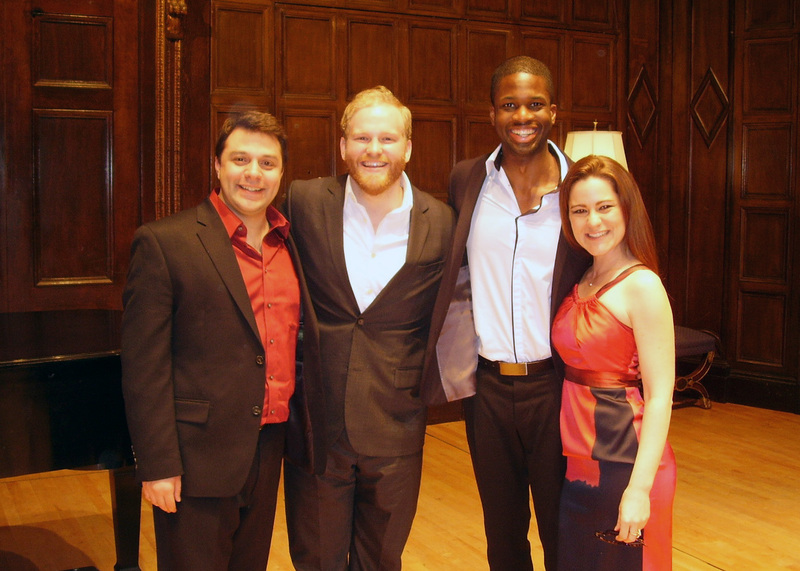 OBU alum Jacob Watson (second from left) recently tied for second place in the prestigious Lotte Lenya Competition. Watson poses with (L-R) first-place winner Matthew Grills, second-place winner Justin Hopkins and third-place winner Megan Marino. Photo courtesy Kurt Weill Foundation for Music.